When Rayo Vallecano made a loan deal with Real Betis for Roman Zozulya, a player linked to far-right ultras and the neo-Nazi Azov Battalion in Ukraine, the team's famously left-wing supporters started a 'Zozulya Not Welcome' campaign that has since led to the player being sent back to his parent club. ¡de la República de Valleka! Estamos con todas las aficiones… ¡Antifascistas! Around the world there are many neighbourhood teams. London is probably the city most characterised in that sense, followed closely by Buenos Aires, where there is a neighbourhood derby of the highest level (Independiente-Racing, el Clasico de Avellaneda). Every one of these clubs obviously has a special tie with its own locality, developed over years of popular passion and a daily life a stone’s throw from the stadium, the social clubs and training centres. 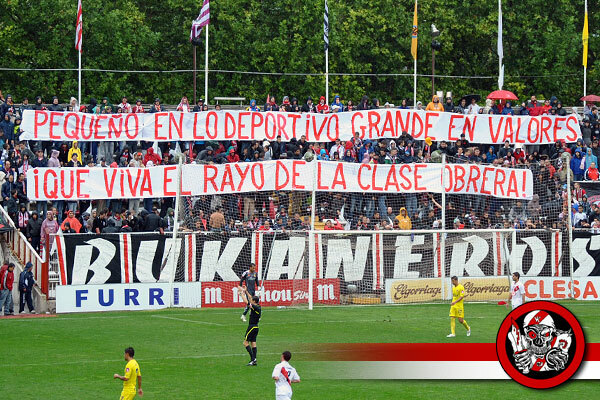 Only one, however, can boast of a political tie with its area and its supporters: Rayo Vallecano. Rayito, as its hinchas, is a unique football club. Not for ‘philosophical’ choice, as with Athletic Bilbao, or for a track record without comparison like that of Real Madrid, its hated city rival. Rayo Vallecano are unique because they represent in everything and for everything the neighbourhood of Vallecas (or Vallekas, as it’s written within the Spanish radical left) and the people who live in it. It wasn’t ‘adopted’ by outcasts as in the case of St. Pauli and it’s too small and contained to be compared to Celtic in Glasgow: Rayo is Rayo and a long proletarian story that speaks for itself. Founded in 1924, seven years later it signed up to the recently formed Federación Obrera de Fútbol, where it played until the end of the Spanish Civil War. The little club from Vallekas had, from the start, to fight an uneven battle against two giants of Iberian football that, to its misfortune, found itself in the same city: Real and Atlético Madrid. Until the 1970s, it navigated between divisions in the lower tiers but went unbeaten in the 1976-77 season and earned its first promotion to the higher in its history. Rayo Vallecano represents (in a symbolic sense, I don’t want to exaggerate) the revolutionary spirit in an environment as unrevolutionary as that of football. In concrete terms, since the Bukaneros appeared in the stands and infected the other sections of the stadium. It’s a fact and to dispute it would be a lie. The stadium cheers (almost) entirely the banners and political chants of the ultras’ end, and it’s that which has made Vallecas a special pitch. Rayo is a club politicised by its fans and it doesn’t need to be afraid to say it: la Franja (NB: another of the clubs nicknames) proudly represents the area; Rayo is left-wing. In the course of the years, moments which demonstrate more than words the special link between the squad and Vallekas have not been in short supply. On the 29th September 2010, the club decided to participate in the general strike called by the CCOO and UGT trade unions against the Zapatero government’s labour reform, the only Spanish firm to make such a decision: the training pitches were closed, just as were the social club and official stadium shop, in a sign of solidarity with the workers of the area. The next day the Bukaneros were able to comment with satisfaction that gestures of that sort rendered Rayo a true pride of the working class. Four years later, coach Paco Jémez made himself the spokesperson for the solidarity campaign to support a lively 85-year-old supporter, Carmen Martínez Ayuso, that had lost the house in which she had lived for fifty years (granted as collateral for a loan that her son, unfortunately, had failed to pay back). The donations of players, members of the technical staff and fans, added to the €5 donated by the club for each ticket sold for the match between Rayo and Sevilla of December 7th 2014, meant that Ms. Martínez Ayuso received a check for more than €20,000 on the 23rd January 2015. But it doesn’t finish there: Carmen showed immediately what Rayo fans are made of, donating half the figure to the children of Wilfred Agbonavbare (historical club goalkeeper, seriously ill and in difficult economic conditions) so that they could come to see him from Nigeria before it was too late. Unfortunately, ‘Willy’ died on 27th January without his children being able to arrive in time, but Carmen’s gesture (and, consequently, all of the hinchada rayista) remains. Recently, the club from Vallekas has returned to the spotlight in relation to the non-acquisition of Roman Zozulya. In this latest episode, the Ukrainian footballer for Real Betis, was loaned to Rayo during the January transfer window but was forced to pack up and go back to Seville after the vibrant protest of the entire neighbourhood. The reason? The explicit sympathies of Zozulya for the neo-Nazis of the Azov Battalion, for the far-right ultras of Dnipro (his former team) and for various icons of Ukrainian fascism. Shouting ‘Zozulya Not Welcome’, the Bukaneros, followed as always by the so-called ‘normal’ fans, they said no to the purchase of the player, justifying their stance with ample and well-documented research after the media claimed that their refusal was due to a misunderstanding of the symbol on his shirt upon his arrival in Spain, an abstract form of Ukraine’s trident mistakenly interpreted by some as a neo-fascist emblem. Fans have made it clear that the t-shirt is the least of their issues, inviting newspapers and TV to look at the evidence of Zozulya’s closeness to the Azov Battalion: wasted effort, of course. The fans, however, have a clear conscience, as opposed to the hacks that have bent over backwards in recent weeks to portray Vallekas as a den of intolerant idiots. The truth, in any case, is available to whoever wants to see it. And once again, Rayo has lived up to its history: pequeño en lo deportivo, grande en sus valores, que viva el Rayo de la clase obrera! For those who speak Spanish, the Zozulya Not Welcome page has all the evidence of Zozulya's support for the far-right, including photos of him with memorabilia of Dnipro's far-right 'White Boys' ultras (with Celtic Cross on it), screenshots of him appearing on the Azov Battalion youtube channel 'Azov Press' and posing next to a scarf with the face of Stepan Bandera, WW2 Nazi collaborator. It's pretty stone-cold stuff, I'm slightly baffled as to why/how the mainstream media are still covering it as 'allegations' by irrational football fans.